The Westview Neighborhood Commercial (NC) District, a project no less than eight years in the making, has become a reality when the Atlanta City Council voted to adopt the legislation at their December 5, 2016 meeting. Westview neighbors first put the Master Plan and Neighborhood Commercial District projects on the agenda of the August 2008 Development Committee agenda. The next year and a half was spent researching other Atlanta master plans and neighborhood commercial districts, and finding grants to fund the required resident notifications about a planning workshop. The Neighborhood Foundation made it possible to hold the commercial district workshop in May 2010, which was led by Village Habitat Design and assisted by Development Committee members. The outcome of the workshop was the Westview Master Plan, which was adopted by Atlanta City Council in 2001. The Neighborhood Commercial District was outlined in the master plan, and therefore ultimately helped the Westview Community Organization, Westview Commercial District Association, and City of Atlanta’s Office of Planning to work together to create the necessary zoning changes. 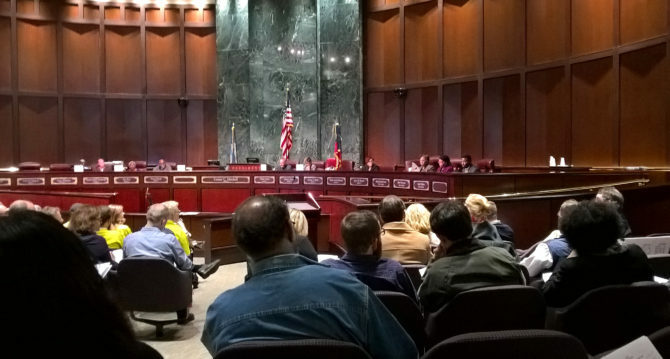 After a series of neighborhood meetings the legislation was introduced by Councilmember Cleta Winslow, and after the due process of coming before the Zoning Review Board (photo above), the Zoning Committee, and ultimately the Atlanta City Council, the legislation was approved to become Atlanta’s NC-15 district.